One of my pastimes is checking out the abandoned flipcharts I find in the variety of offices and meeting rooms I get to frequent. It’s quite a revealing pastime (possibly about me unfortunately). Occasionally you do stumble across sensitive material, obviously this goes straight in the confidential waste bin, or back into the hands of the originator. However, it’s the other material on flipcharts that fascinates me. I reckon you can get a useful insight into an organisation from the debris gets left behind on the flipcharts. The more frantic the scribbles, the more I like it. Line & box diagrams, mind maps, dodgy graphs, stick people and bullet points all feature. Whatever form it takes it’s all a great informal record of organisational life. The real story of what’s going on from the hands of the people who know the place best. This helpfully gives me an opportunity to talk about some recent experiences where a drawing has helped focus a discussion. Twice recently I’ve sat in meetings, slightly bored and detached from the action (a familiar situation for many I suspect). What this allowed was the opportunity for a bit of observation and testing a theory of mine about the impact of flipchart drawings. Meeting 1. Business Process Review. Nine people sat around a table discussing a document management process. It felt like something from a Dilbert cartoon. The alpha males and females (3 people) were vying for superiority, while two others were doing the best they could to get heard. The rest were in various stages of disengagement. Plenty of arm waving and use of technical language to demonstrate ‘one’s own cleverness’ was going on. What looked obvious to me was that there were at least two versions of the truth being spoken about, and a contractor (supposed to be delivering the solution) looking confused, frustrated and increasingly desperate. Eventually some bright spark suggested the contractor draw the process on a flipchart. Bingo! Suddenly everyone was talking about the same thing and rapid progress was achieved. It took 40 minutes to get to this point and 10 minutes to agree some action. Meeting 2. Comparing Supplier Costs. Thinking about it now, this was a completely daft situation. A group of 7 people were trying to compare two sets of figures. Most people had the first set of figures. Only one person had a copy of the second, and had only shared them verbally. The discussion was passionate and detailed, with strongly held views about the figures, but completely pointless. Eventually someone wrote down the figures on a flipchart. It immediately became obvious where the issues where. This was incredibly not in the place where people had been expressing strongly held views! The group then got around to concentrating on the most important issues and developing options. Again, this one took about 40 minutes (of wasted time) before someone wrote on the flipchart and focused the discussion. A few ‘scribbles’ on a flipchart puts it all back on track. If this is what can be achieved with a few amateur scribbles, imagine what can be achieved through expertly drawn graphics? Have a look at an earlier post about graphic facilitation and the fantastic material organisations like Delta7 generate by working with the people in organisations. Focusing a discussion or a meeting by putting something down on paper can (usually does) help everyone understand and ‘speak the same language’. Using drawings, graphics or other illustrations can really help, especially with complicated processes, ideas or difficult situations. Next time you are in a meeting going nowhere, have a go yourself, start drawing and see what happens. If you are wondering, here is the connection with Draw Something. If you are slightly nervous about putting something on paper, download the Draw Something app and start drawing. Practice makes perfect … possibly. I wonder if I can fit Elvis into a work context…….? Very perceptive Chris, as ever. Nice humour too! And draw something is a great app. Thanks David, and thanks for the plug on twitter. I was going to use one my own Draw Something creations ………. 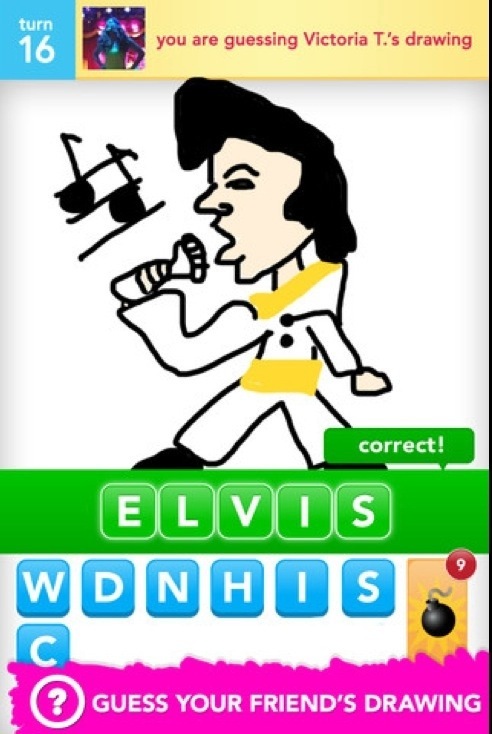 but nothing beats an Elvis drawing. Back to a bit more practice before I share mine with the world. ← Will descending from Welsh Sheep Farmers prevent you collaborating?